North Carolina Railroads And Railfanning In "The Tar Heel State"
North Carolina railroads offer a wide variety of operations, found in few other southeastern states; from coastal and mountainous operations to high-speed main line freight and passenger trains, including plenty of local shortline services. And, as Southern states typically go, North Carolina offers spectacular scenery as a backdrop to railroading operations, whether you are along the coast, in flatlands of the Piedmont, or high in the Smoky Mountains. 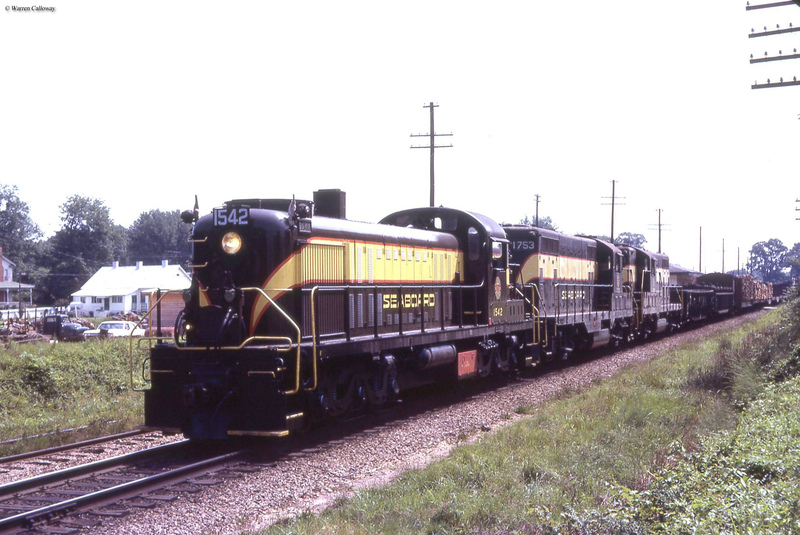 The Tar Heel State also has a rich railroading heritage dating back to the early 1830s and during its peak was home to no fewer than four eastern Class I railroads with the highly profitable and respected Atlantic Coast Line headquartered in its coastal and port city of Wilmington until 1960. 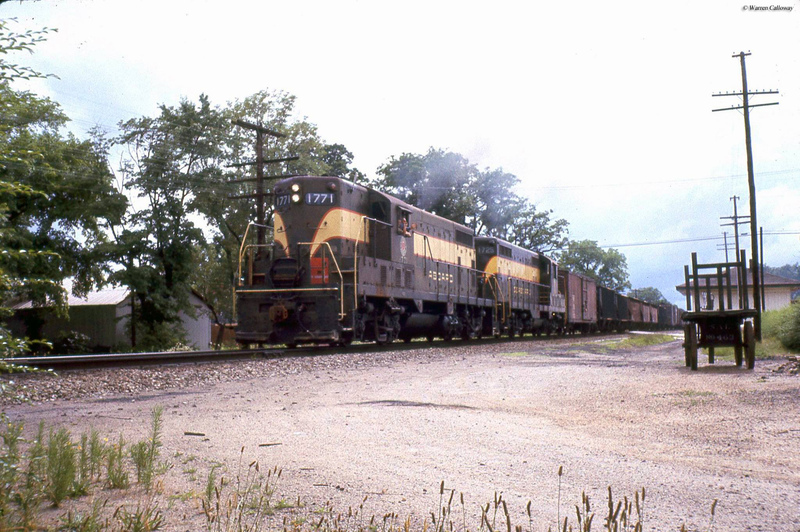 In any event, the article here also provides additional links to other pages here at the site which relate to either North Carolina's railroad history or present day operations. Be sure to check them out. North Carolina's first system dates back to 1833 when the Wilmington & Weldon Railroad was charted to connect its namesake cities, which it completed on March 7th, 1840. By doing so the railroad became the longest railroad operated in the world at that time, spanning some 161 miles! By the turn of the century the W&W would become part of the ever-growing Atlantic Coast Line system. Following the W&W's opening, North Carolina quickly became an important traffic generating and terminating state as it not only grew much tobacco and cotton but also became heavily industrialized, particularly in textiles. 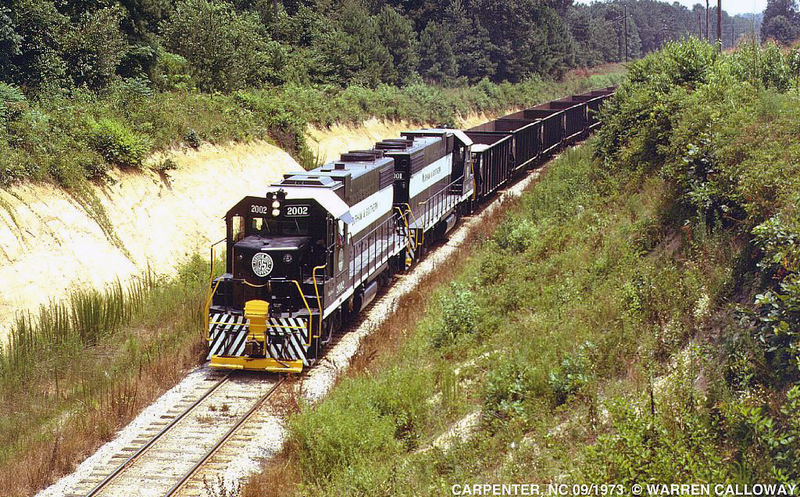 In time the Tar Heel State would become home to four of the South's best-remembered railroads. Today, North Carolina is mostly the realm of CSX and Norfolk Southern Railway with NS's ex-Southern main line running through Charlotte and Greensboro (along with numerous other secondary lines) and CSX's ex-Clinchfield in the mountains and SAL and ACL main lines near the coast. The rest of the Tar Heel State's rails are operated by numerous shortlines and include the historic Aberdeen & Rockfish Railroad, Winston-Salem Southbound Railway, Atlantic & Western railway, Carolina Coastal Railway, Carolina Southern Railroad, Laurinburg & Southern Railroad, Pee Dee River Railway, Wilmington Terminal Railroad, and the Chesapeake & Albemarle Railroad. Having visited North Carolina on countless occasions throughout my life I must say that its railroading is very unique and interesting as it really does offer a little of everything from an operational standpoint. I have seen both the Laurinburg & Southern and Chesapeake & Ablemarble Railroads in operation and enjoyed every bit of it. I also was lucky enough to have a friend give me a quick tour of Raleigh's rail operations (which includes both NS and CSX) and was as fascinated by the scenes of history still present, as the trains themselves. Today, North Carolina is home to just over 3,000 miles of trackage, which is about 59% of its one-time total of more than 5,500 in the 1920s. With a loss of about 41% of its railroad infrastructure since then, North Carolina has fared better than the national average of 45%-50%. Additionally, in recent years the state has been proactive in preserving rail corridors for potential future use. 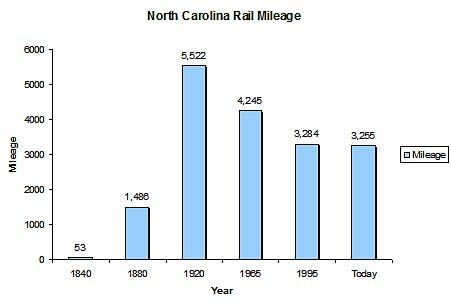 For more information on North Carolina in terms of route mileage over the years please take a look at the chart below. Passenger and commuter rail in North Carolina are, to put it bluntly, a step above the rest of the country. The Tar Heel State is being proactive in recognizing the benefits of rail and has planned accordingly. Not only does the state own the North Carolina Railroad (NCRR), which owns a rail corridor running between Charlotte and Morehead City but also owns significant abandoned rights-of-way in the state that it deems important for possible future rail service. 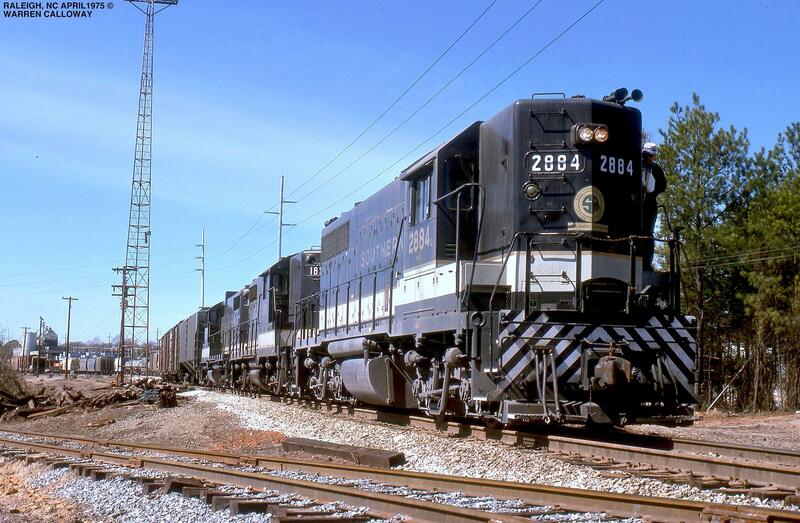 Today, the NCRR is leased to Norfolk Southern, which handles freight service over much of the route (between Charlotte and Raleigh) and oversees the ongoing upgrades being paid for by the State of North Carolina. The state also subsidizes its own passenger trains over the line. With the help of Amtrak, North Carolina operates the Charlotte-New York Carolinian and Raleigh-Charlotte Piedmont (in addition Amtrak also operates its own Crescent and Silver Service through the state). The future of North Carolina's commuter railroad operations looks very bright. The state has paid for the restoration of numerous historic railroad depots along its route to be used for daily passenger service and is currently planning operational extensions as far east as Wilmington and as far west as Asheville. And, what's more, North Carolina plans to develop all of this trackage into a high-speed corridor. North Carolina also features several museums and tourist railroads such as the North Carolina Transportation Museum in Spencer which is home to the largest still-standing roundhouse at 37 stalls. Others include the Great Smoky Mountain Railway in Dillsboro and Bryson City that offers spectacular views of the Smokies. All in all, the state offers some fantastic and unique operations, with spectacular scenery that only a Southern state could provide. If you are planning a trip you may want to focus on one specific area that interests you most, such as the mountains, Piedmont region or coastal plains as there is far too much to see unless you have lots of time to visit all three parts of the state. 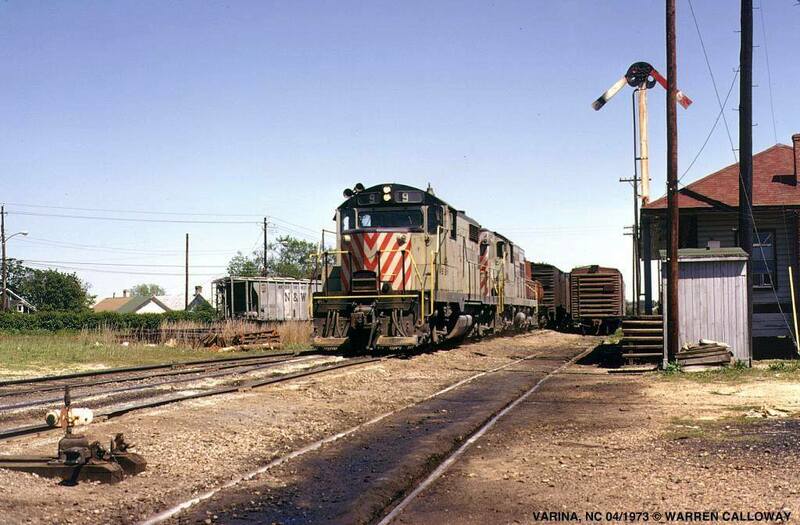 Lastly, for more information about North Carolina railroads in general please click here to visit my good friend Dan Robie's personal website about trains in the Tarheel State. The site is still a lengthy work in progress so please be patient as more material is added. And on that note, here are few final recommendations you may want to visit; first, although it no longer sees trains NS's torturous Saluda Grade (the steepest main line railroad in America at 4.7%) is a marvel to see; second, CSX's main line to Wilmington features the longest stretch of straight, tangent track in the country at nearly 79 continuous miles; and lastly, both CSX and the Norfolk Southern Railway have winding loops to gain elevation in the western mountains at Old Fort (NS) and Spruce Pine (CSX). Whatever you decide, have fun as there is plenty to see in North Carolina!